Whenever I make a batch of my favorite meatballs (I like to make a big batch and keep some in the freezer), we always have meatball subs for dinner the day I make them. 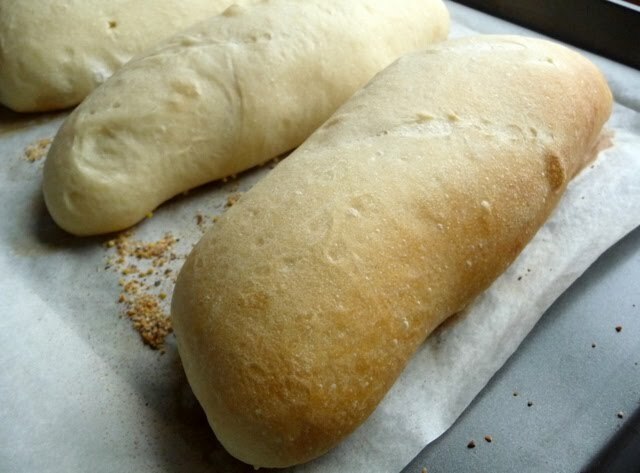 I thought it would be fun to try making my own hoagie rolls this time. As usual, I turned to the Bread Baker’s Apprentice by Peter Reinhart for a recipe for Italian bread. You have to plan ahead – since this recipe requires a biga that is prepared ahead of time. 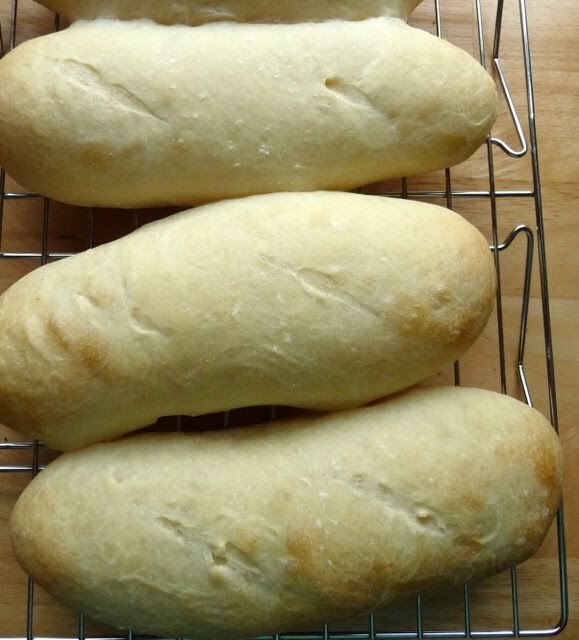 But I still don’t think that making your own bread is that hard – it does require time and planning, but most of that is proofing time and not actual hands on time. I thought these rolls were perfect! 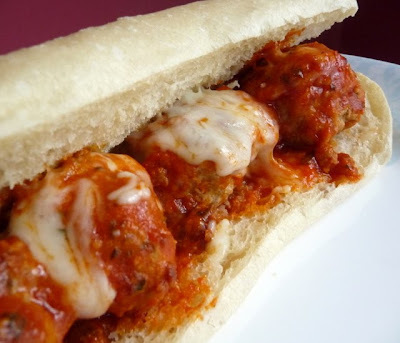 Not only were they great for meatball subs – they would make a great turkey or chicken finger sub (my two favorites!). 3/4 – 1 cup (7 to 8 ounces) water, room temp. 1. Stir together the flour and yeast in the bowl of an electric mixer. Add 3/4 cup plus 2 tbsp. water and mix on low for 1 minute with the paddle attachment. Adjust flour and water so that dough is neither too sticky or too stiff. 2. Switch to dough hook, and knead on medium speed for 4 minutes, until the dough is soft and pliable. The temperature of the dough should be between 77-81 degrees F.
3. Place dough in a lightly oiled bowl, and coat with oil. Cover with plastic wrap and allow to ferment at room temp for 2 – 4 hours (or until doubles in size). 4. Remove dough from bowl and knead slightly to degas. Return to bowl and cover with plastic wrap. Place in refrigerator overnight (or up to 3 days). 1. Remove biga from refrigerator 1 hour before making the dough and cut it into 10 small pieces with a pastry scraper or serrated knife. Cover with a towel or plastic wrap and let sit for 1 hour to take off the chill. 2. Stir together the flour, salt, sugar and yeast in the bowl of an electric mixer. 3. Add the biga pieces, olive oil, and 3/4 cup milk and stir together until a dough forms, adjusting the water or flour according to need. The dough should be slightly sticky and soft. If the dough feels tough and stiff, add more milk to soften. 4. Mix on medium speed with the dough hook for about 10 minutes. The dough should pass the windowpane test and register 77 to 81 F.
5. Lightly oil a large bowl and transfer the dough to the bowl, rolling it to coat it with the oil. Cover the bowl with plastic wrap. 6. Ferment at room temp for approximately 2 hours, or until the dough doubles in size. 7. Divide dough into 9 pieces of about 4 ounces each. Carefully form the pieces into rolls degassing the dough as little possible. Lightly dust with a sprinkle of flour, cover with a towel or plastic wrap, and let it rest for 5 minutes. Then complete shaping the rolls, if necessary. 8. Line a sheet pan with parchment and dust with cornmeal. Place the rolls on the pan and lightly mist with spray oil. Cover loosely with plastic wrap. 9. Proof at room temp for about 1 hour, or until the rolls have grown to about 1 1/2 times their original size. 10. Preheat oven to 500F. Score the rolls with 2 parallel, diagonal slashes or 1 long slash. 11. Place rolls on sheet pan in oven. Pour 1 cup hot water into steam pan in the oven and close the door. After 30 seconds, spray the walls of the oven with water and close the door. Repeat once more after another 30 seconds. After the final spray, lower the oven setting to 450 F and bake until done, rotating 180 degrees, if necessary, for even baking. It should take 15 minutes for rolls. The rolls should be golden brown and register at least 200F at the center. 12. Transfer the rolls to a cooling rack and cool for at least 1 hour before slicing or serving. your bread looks fabulous! i never make my own sub rolls but I should! OMG this was the best thing ever. When christine made this for our meatball bombers i got down on one knee and asked her to marry me all over again. I've been on a big homemade bread kick lately...I'll have to try these soon!